A clear skin pore toner for oily and overactive skin, with 99% naturally derived ingredients. Andalou Willow Bark Pure Pore Toner has fruit stem cell complex with Argan stem cells, Kombucha probiotics, and Aloe Vera polysaccharides to instantly hydrate with skin calming nutrients to soothe and gently balance pH. Willow bark purifies pores for a clear, refreshed complexion. 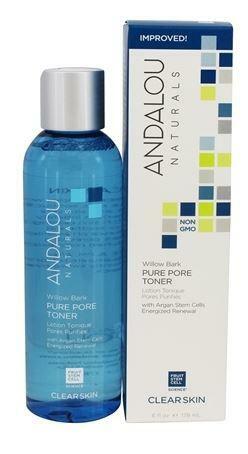 How to use Andalou Willow Bark Pure Pore Toner; AM & PM. After cleansing, saturate cotton pad and gently sweep over face and neck.